I use openCanvas5 for sketching, inking, and painting. Photoshop CS3 is used to any post-editing. Why do you use openCanvas5? What about SAI? I initially used oC3 because it had a very simple and fast interface for changing brushes on the fly. Later, I found out that the lines that oC3 makes were really unparalleled to whatever else I tried to draw with. oC3 eventually became too unstable for the size of my files, so I moved to oC5. 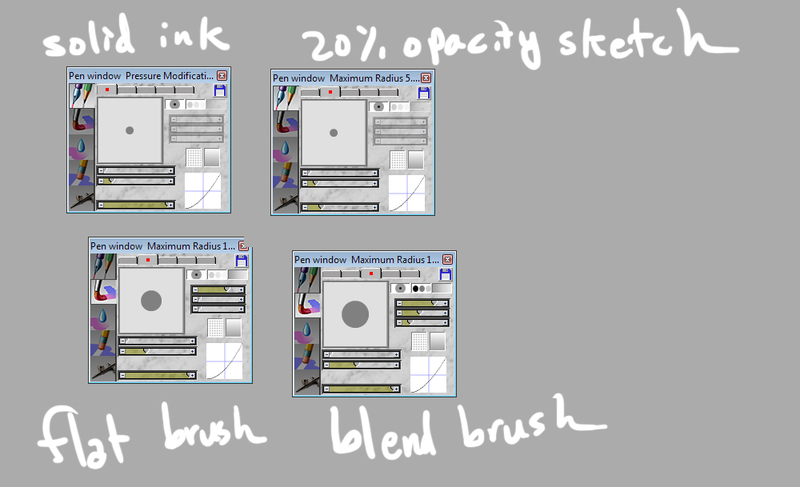 It retains the legacy brushes from oC3, but the UI is a little different. It is also much more stable. Unfortunately, it, still suffers from some odd bugs. I tried SAI once, but was not accustomed to dealing with how it handled its workspace. What Photoshop brushes do you use? Can I have them? They are very simple in nature, so I don’t actually rely on any fancy brushes when I draw or paint. Apparently you can use textured brushes in oC3 still, so I may experiment with that in the future. I used to use a Graphire 3 4″x5″. However, I’ve retired that and switched to an Intuos4 Medium. There are some models I keep track of, as well as Met-Art and currently using Posemaniacs for study. Fashion catalogs help, too. Hello. Do you do commissions? Sorry, I don’t for the time being. Just wondering.. Did you go to uni for art? And where at if you did/didn’t? Good experience? I didn’t go to school for art. I studied biological sciences at UCI.